The novel-novel has a strong arc, an engaging and eccentric protagonist, a wide sweep (bonus points for England, during the wars), tragedy, comedy, coming-of-age and beautifully executed literary prose. The good ones aren’t formulaic or cliché; they come up with new ways to tell the same story. The story is loneliness, lost love, failures large and small, weird families and smallness in the face of nature. There are plottier versions and quieter, thinkier versions, but they all thoughtfully move a hero from point A to point C through point B. 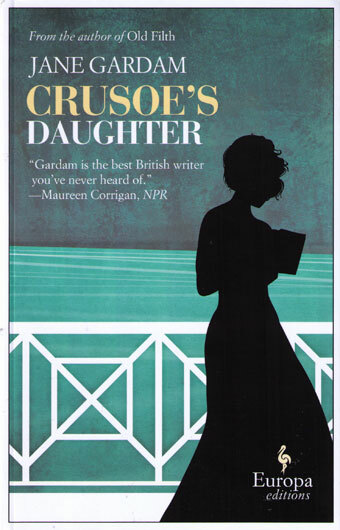 Very little could be more novel-novel-y than Jane Gardam’s 1986 Crusoe’s Daughter. The book is the story of a little girl, Polly Flint, growing up isolated with two aunts somewhere on the Northern coast of England, starting when Polly is 6 in 1906 and running through both wars, till the mid-80s. Polly is a reader, and forms a lifelong bond with the book Robinson Crusoe, whose story of isolation and spiritual development somewhat echoes her own. The book is beautifully written, beautifully executed and engaging throughout. Various online sources say that it’s Gardam’s favorite of her books and is based on her mother’s life. I haven’t read Robinson Crusoe (!) and like stronger pleasures than the novel-novel, so my praise is probably fainter than the book deserves. The focus on the landscape, and the plot about an isolated little girl in the care of eccentric relatives reminded me unfavorably of Marilynne Robinson’s Housekeeping. The Robinson is a similar experience through a weirder glass, and her prose makes the reader clutch her head in ecstasy, which wouldn’t be appropriate during a novel-novel. They’re supposed to tell you a story, not smite you like an Old Testament god. I kind of like being smitten. Still, I suspect that many of the gorgeous set pieces from Polly Flint’s life–a horse and carriage on the beach, a Victorian mausoleum, a childhood brush with fever, a trip to Paddington to retrieve Jewish refugee children in ’38–will lodge permanently and pleasurably in my memory, vivid scraps of someone else’s forgotten life.